These are for real and they form naturally in a mineral rich horizon over a long time. Then the surrounding unmineralized sandstone is eroded away to leave these behind. All as natural as can be. Yet it leaves behind an unnatural landscape that begs the imagination. Well worth the visit if close by. Are they the remains of a hastily abandoned game of giant billiards? Probably not, but the array of huge boulders in Torysh Valley, Kazakhstan may bring this fantastical image to mind. Actually enormous concretions that formed millions of years ago, these rocks are unusual due to their shape and impressive size. Natural explanations exist for their unique appearance, but other beliefs are rolling around as well. 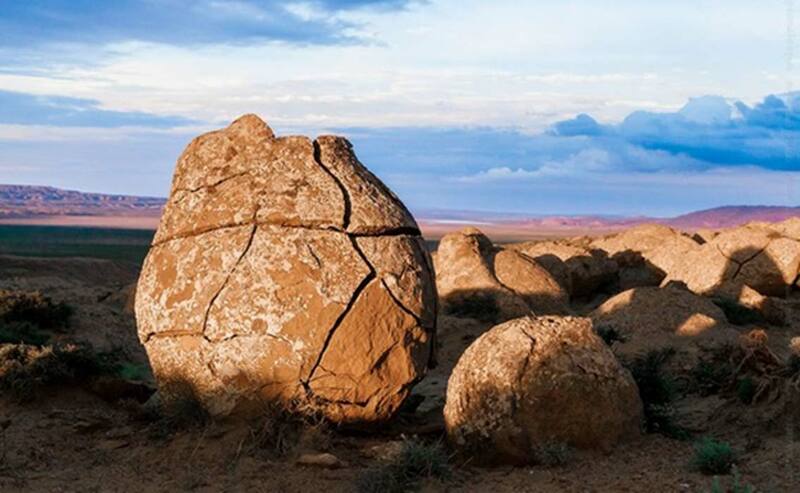 In the Mangystau region of southwestern Kazakhstan amongst mountains, valleys, deserts, and tundra is a valley called Torysh filled with strange round boulders that look like giant eggs or billiard balls. They tell us something about the depositional environment of the time, as well as provide a wonder of geology. The “balls” in question most likely date from the mid Jurassic to the early Cretaceous period (180-120 Ma). They are probably made of either silicate or carbonate cement. Most geologists who have examined them have said that they are giant concretions, though fringe thinkers say that these balls were made by extraterrestrials or ancient, technologically advanced humans. Concretions are formed in porous sedimentary rock such as sandstone or limestone when mineral laden water flows through the porous spaces. When the minerals reach their saturation point they precipitate out of solution and fill the pores. Concretions form when these minerals precipitate in layers around a core such as a rock, shell, or bone. Because of their unusual shape, giant concretions are often mistaken for fossilized eggs, turtle shells, or even artificial structures of extraterrestrial and sometimes terrestrial origin. This has led to the suggestion that these structures are artifacts of ancient advanced civilizations. Could these strange round structures in Torysh be artificial or are they just a natural wonder? Most concretions are not very large, but it is possible to get giant concretions. Other places where giant concretions have been found outside of the Valley of Balls are parts of Siberia and beaches and deserts in California. Two examples in the USA are Bowling Ball Beach and the Colorado Desert near Anza Borrego Desert State Park. The rocks in the surrounding Torysh Valley region are mainly limestone and sandstone probably deposited in a shallow sea environment mostly during the Mesozoic. Sandstone and limestone are known to be reservoirs for oil and natural gas. Many plentiful oil fields are present in western Kazakhstan as a result. Reservoir rock must be porous so that oil and natural gas can flow through rock. Concretions require the same porosity, so it is no surprise that they would present in such rocks. It is clear that the giant spherical concretions come from the underlying rock. Although many of the “balls” are loose boulders, some of them are clearly embedded in the rock and are slowly being liberated from the substrate as the surrounding sedimentary rock erodes. Similar concretions were found in Siberia by coal miners while digging. Because the concretions are large and difficult to bore through, they removed them and piled them outside of the mine so people can see them. Some have said they are fossilized dinosaur eggs or artifacts of lost ancient civilizations, though Russian geologists confirm that they are concretions. Another example of giant concretions would be the large reddish concretions found at Theodore Roosevelt National Park. These concretions are made of a mixture of silicate and carbonate cement. The reddish color comes from hematite, goethite, and other ferrous (iron-bearing) minerals. Along the shores of Lake Huron at Kettle Point in Ontario, Canada there are giant calcite concretions which are nicknamed “kettles” because of their characteristic shape. It is not entirely clear how giant concretions form compared to more typical smaller concretions, though it is known that they tend to form deep beneath the ground. They also take a considerably longer time to form because of their immense size. They are not all round - some are botryoidal, fusiform, or otherwise unusually shaped. Since the balls in Torysh valley resemble concretions found in other parts of the world it is likely they are concretions of silica or carbonate cement. No concrete evidence has been found indicating they were constructed by humans or any sort of non-human intelligence, or that they are fossilized eggs for that matter. Mysteries like these are a part of the process of science. They are also what keeps science going, since if the world were to suddenly run out of mysteries, scientists would lose their jobs. For this reason, we should be thankful for such mysteries as they show that there is ever more to learn about nature. Some of our guesses might be wrong, but as we figure out which theories are incorrect we will also get an increasingly more accurate understanding of the world.